Hortus Camdenensis | Acacia amoena Wendl. 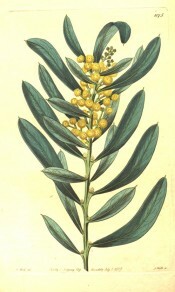 Half hardy, bushy shrub with bipinnate, bluntish oblong, blue-green phyllodes and axillary racemes of bright yellow flowers in compact, round heads in spring. To 2m. [FNSW, Beadle]. ‘[Acacia subcaerulea is] Said to be a native of the tropical part of New Holland. Our drawing was made in the conservatory of the Comtesse de Vandes, in June 1826. A handsome species, remarkable for the fine copious blue bloom with which it is covered. […] The immediate affinity of this plant is with the Acacia amoena of Wendland.’ [BR f.1075/1827]. Introduced to Britain in 1820. [JD]. Listed in the 1850 and 1857 catalogues [T.12/1850]. Occurs in the Blue Mountains of NSW in dry sclerophyll forest and woodland [FNSW, Beadle] and probably collected there.